The action continued on days 3&4 of the 2013 O2C Doeberl Cup. Indian GM SP Sethuraman continued his good form from the first 2 days, scoring another 2.5 points from the next 3 rounds. But his run was halted in Round 8 when top seed GM Li Chao was able to convert a knight a pawn ending, joining him on 6.5 points. This also allowed a number of other players to get closer to the lead, with GM's Vajda, Zhao, Stocek and Van Wely all on 6 points. In the final round Zong Yuan Zhao plays Li Chao and Sethuraman plays Loek Van Wely, meaning that 7 or 7.5 is going to be the winning score. Further down the field a couple of players are playing for title norms. Luke Li needs to beat IM Somak Palit for an IM norm, while Mongolian WFM Sengeravdan Otgonjargal is playing for a number of norms, depending upon the result of her final game against GM Darryl Johansen. In the Major (Under 2000), Dimitry Partsi and Andrew Saint are on the top board, while Ilija Illic plays Jeremy Reading on board 2. Saint (5.5/6) has a half point lead over the other 3. Aelfric Gardiner-Garden leads the Minor (Under 1600) with 5.5/6. In second place are David Cannon and Kasish Christian. Gardiner-Garden plays Christian on the top board in round 7. The Under 1200 event has already been decided, with Ziqi Yuan winning his final round game over Mark Glanville to finish on 5.5/6. Glanville finished equal 2nd with Walter Wolffs. The Doeberl Cup Blitz was held after the completion of Saturday's play, with 82 players taking part. 9 rounds were not enough to split FM Junta Ikeda and GM RR Laxman, as they drew with each other in round 4, but beat every other opponent. They finished on 8.5, 1.5 points ahead of Dutch FM Joost Van Ruitenburg. The final round in the Premier, Major and Minor all start at 9:30 am tomorrow, and you can follow the action from the top 4 boards of the Premier, as well as the top Major and Minor boards, on the tournament website. Day 2 of the 2013 O2C Doeberl Cup was a very busy one, as you can see from the lateness of this post. All 4 tournaments were in action yesterday, meaning that all 240 players were at the board and playing. The Premier was once again tough on the overseas players, with the upsets continuing. Having beaten Loek Van Wely in rd 2, IM Stephen Solomon then beat GM Jiri Stocek in round 3. Solomon passed up the opportunity to play a 'safe' ending, instead going for the tactical endgame where he excels. Also doing well in the third round were FM Bobby Cheng who drew with top seed GM Li Chao, Luke Li who drew with GM Zong Yuan Zhao, and FM Domagoj Dragicevic who beat GM Zoltan Varga to reach 3/3. In the 4th round the top overseas players did get some of their own back, with GM Vajda Levente stopping Solomon's charge, GM Sethuraman beating Dragicevic in a tough game, and Li Chao taking the point from Luke Li. However the effort of playing 4 rounds in 2 days is beginning to show, with a number of other games being drawn, including the game between GM Loek Van Wely and FM Junta Ikeda. Round 5 is currently underway, with a number of crucial matchups on the top boards. You can follow the live action at the tournament website, and join in the discussion at the tournament live blog. The first day of the 2013 O2C Doeberl Cup got off to a sedate start, but ended with a lot more action. With the organising team taking around 2 hours to transform an empty playing hall into a fully fledged chess venue, most players turned up to find everything ready to go. So relaxed were the playing group that at 1 minute before start time we could only spot around 40% of the players! However once the clocks were started the 70 player Premier field quickly appeared and the action got under way. Somewhat surprisingly for the first round of the Doeberl Premier, there were very few upsets. George Lester scored the quickest win after Indian IM Aditya Udeshi failed to turn up for the tournament (despite having registered for the tournament). Fortunately this was the only 'no show' as the tournament policy of not pairing unpaid entrants weeded out the players who entered in advance but then made no effort to contact the organisers when they decided they weren't turning up. Apart from the point to Lester, Tony David and John Nemeth were the only other 2 players to take something from the top half. Davis drew with IM Andrew Brown in a very tricky game, while Nemeth drew with IM Somak Palit. However it was a completely different story in round 2. Already there were a number of GM v IM pairings on the top boards, as well as some younger players looking for scalps. The first big upset was Justin Tan beating GM Atilla Czebe. This was quickly followed by number 2 seed GM Loek Van Wely going down to IM Stephen Solomon. The game seemed even, if double edged, when a mis-step by Van Wely saw him quickly overrun on the kingside. Then in one of the last games to finish, GM Adam Horvath over committed to an attack and when it didn't quite wok found himself down a piece against Luke Li. After a time scramble and some further hairy moments Li was finally able to consolidate his advantage an score a significant victory. Going into the third round there are still 13 players on 2/2. There are still a number of important match ups on the top boards with the FM Bobby Cheng v GM Li Chao being the standout. Also starting today will be the Major (Under 2000), Minor (Under 1600) and the Under 1200 event. All tournaments start a 1pm, and there will be live games and live blogging on the tournament website. The 2013 Doeberl Cup begins tomorrow, with the first 2 rounds of the Premier. At the close of entries there were 75 players, although a mixture of bye requests and unconfirmed entries means that 64 players will be sitting down for round 1 (NB Unconfirmed players who do front up tomorrow will be paired after the start of round 1). When I last checked there were 238 players across the 4 tournaments, and hopefully some last minute entries in the Major&Minor + walk ups for the Under 1200 will push the tournament past the 250 mark. In terms on online coverage there will be live broadcasts of the top 4 boards in the Premier, plus the top board in the Major and Minor (from Friday). I will also be running a live blog throughout the tournament, which can be accessed from the tournament website www.doeberlcup.com.au. We plan to put up as many games as possible on the website as well, prioritising the top boards from the Premier. If you are in Canberra, but not playing in the tournament (or even if you are), you can also catch the live coverage by GM Ian Rogers. He normally starts about 2 hours into the round, and there is no charge to watch. The action kicks off at 1pm tomorrow, with round 2 starting at 7pm. I've just heard the sad news that Malcolm Tredinnick passed away on the 17th of March 2013. He was quite a strong chess player (2100+) and our paths crossed at a number of events, although he was playing on higher boards than me. Even when he wasn't playing, he would often drop into events to catch up with friends and kibitz the action. Apart from being a good chess player, he was a fantastic programmer. He worked on a number of open source projects and was very active in the Python programming community. Originally from Melbourne, he was living in Sydney at the time of his passing. His Funeral will be on Thursday 4th of April at North Ryde Cemetery, Sydney at 2:30pm. Straight after the 2013 O2C Doeberl Cup is the 2013 Sydney International Open. Apart from the tournament itself, there will also be a fundraising dinner for the 2013 Australian Youth Olympiad Squad. It is on the 4th of April (Day 2 of the SIO), and during dinner there will be an auction of various chess items, as well as a trivia quiz, with prizes supplied by Chessbase. Doors open at 7pm, food starts at 7.30 and will continue until 10.30 for players finishing late, trivia and auction start at 8. The ACT Junior Chess League kicked off its weekend chess season today with the ACT Junior Lightning Championship. The tournament attracted a big field of 63 players (23 up from last year), and pleasingly, a number of strong juniors turned up to play. Despite the strong field, Fred Litchfield took out first place with a Fischer-esque 11 from 11. After the first few rounds he was essentially taking on all his closest rivals, and managed to defeat every one of them. In second place was Michael Kethro on 10/11, who after losing to Litchfield, kept chasing him for the rest of the tournament. In third pace was Harry Press with 9 points (losses to Litchfield and Kethro), a score that was in fact good enough to win outright last year. The tournament was run by WIM Emma Guo (who was in fact eligible to play if she chose), and went off with a minimum of problems or tears. For a number of players it was also their first 'real' chess event, and based on what I saw, they all seemed to enjoy themselves immensely. Over the last few weeks I've witnessed a number of games that have ended in disaster for the player who was nominally winning. As a result I've come up with yet another chess adage, to be used when your opponent is playing on in a worse to losing position. "There is always one trick". The point of saying this to yourself during the game is to force you to actually look for the trick, rather than just blindly following your "anything wins" plan. If you can see the trick, then obviously you can take steps to avoid it. An example comes from the game Feuerstein v Mednis 1957. In the diagrammed position Mednis had just played a3 and offered a draw. Feuerstein refused the draw (correctly) but failed to look for tricks in the position. Obviously the pawn wants to queen, but is covered by the rook and the bishop. 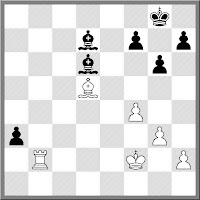 The rook has to move, but if moves along the file then it is only the bishop covering a2. There is also the fact that Black can also play Bc5+. If White had added all these ideas up, he may have spotted what Black was hoping for. Instead he played Rb7? ?, walking into Bc6!! which wins on the spot. Rather than win, or even draw, Feuerstein had to resign instead. Anyone who tipped either Carlsen or Aronian to win the 2013 Candidates Tournament, may soon be collecting their winnings. After 6 of the 14 rounds, Magnus and Lev have taken a 1.5 point lead over the rest of the field. Aronian started the event with a draw and two wins, before Carlsen caught up in round 4. Both drew in round 5, and before winning again in the 6th round. At this stage it seems that the key game will be their round 8 pairing, with Carlsen having the White pieces. Of course there is still a chance that one or other could come unstuck earlier, but for now they seem to be well ahead of the field. The other player who was considered a favourite pre tournament was Vladimir Kramnik. However he has failed to win a game, starting the tournament with 6 straight draws. Nonetheless, it isn't for want of trying, as his round 6 game against Vassily Ivanchuk showed. This time next week the O2C Doeberl Cup Premier will be under way. At the moment there are 176 entries across the 4 events, and the usual last minute rush will see the tournament across the 200 mark. But if you are thinking about entering, it is better to do so now than later, as the tournaments do have limited sizes. In the case of the Premier there are less than 20 places left, and with this years tournament being the strongest ever held yo don't want to miss out. There is a little more space in the other events, although the Under 2000 tournament has already reached the 50 mark. The Premier has attracted a record 11 GM's, although we unfortunately lost 2 others. GM Dejan Bojkov was planning to combine his tournament participation with running a FIDE Trainers Seminar in Sydney, but the Australian Chess Federation would not endorse the seminar, meaning it was no longer financially viable for him to attend. A real shame, as not only is he a fantastic trainer, but a delight to have at any tournament. On the other hand GM Loek Van Wely is combining his trip with a little coaching. He will be holding a Master Class with an invited group of players next Wednesday. As the group consists of a number of up and coming Australian players, it will be interesting to see if he coaches himself out of some prize money. An interesting set of results in the 6th round of the 2013 ANU Masters has left IM Andrew Brown in a commanding position. The key game of the round, and probably the tournament was the much anticipated Brown v Ikeda match up. Both players took a large amount of time in the opening, but after found a nice tactical shot on move 18, the game came to a rapid conclusion. The loss by Ikeda gave both Andrey Bliznyuk and Michael Wei a chance to move into clear second place, but they were only able muster half a point between them. A miscalculation by Bliznyuk saw him drop a piece to Kishore Sreetharan, while Wei decided a draw was a good result against Jeremy Reading. Stephen Sengstock and Adrian de Noskowski also drew, while Justin Chow scored his first win of the tournament with a sharp victory over Yijun Zhang. After 6 rounds Andrew Brown is on 6 points, with Ikeda, Bliznyuk and Wei all on 4. However Ikeda has an extra point up his sleeve having player, and won an later round game against Justin Chow. Would you offer a draw if you were Black in the final position of the following game? Petrosian did, not caring that he seems to be close to winning in this position (at least according to Fischer in Sports Illustrated ). However if you feed the position into your favourite chess engine it does not seem to give Black that much of an advantage, even looking 10 moves (20 ply) ahead. Of course what is a small edge for the computer may be a decisive one for a world class GM, but given that Petrosian went on to win the tournament, maybe he just wanted the day off. A Toaster with a chess connection? Not really, but my old toaster gave the ghost this morning, so my wife headed off at lunchtime to purchase a new one. Clearly she was sick of cheap but fragile models, so she splashed out on a heavy duty, 4 slice, all bells and whistles model. But in the end what surprised me wasn't the price, but the brand. It was a 'Morphy Richards', which I had never heard of before. A quick check on the history of the company indicated that it was not some far sighted creation of Paul Morphy, but instead the partnership of Donal Morphy and Charles Richards formed 70 years ago. So no real chess content, unless I can find the setting that makes the toast with alternating dark and light squares! Jeffrey Plew completed the 'double' at the 2013 Dubbo Open, winning both the NSW Country Championship, and the Dubbo Open itself. He started the day with a win over joint leader Harry Press, before drawing his round 5 game with Don Keast. The draw allowed Trent Parker to catch up, and their final round game decided the tournament. Plew gained an advantage over the opening and soon Parker's pieces were caught in a set of pins and discovered attacks, forcing a quick resignation. With this win Plew reached 5.5/6 meaning the remaining games were for the minor placings only. On board 2 Don Keast looked like he had a better position against David Lovejoy, but having avoided a repetition, Keast ran short of time and blundered into a mate in 1. This left Lovejoy with outright second while Kempen and Press drew on board 3 to share third place with Parker, and tournament surprise Dragan Granjas. Ryan Keeble was the best placed Under 1500 player, with Ben Martin and Andrew Mower sharing the Under 1300 prize. Local Dubbo Junior Nikhil Rajesh picked up the best Junior prize after scoring 3.5/6 including a final round draw with Bill Egan. As the arbiter I found the tournament very enjoyable and quite easy to run. In fact most of the hard work was in the Saturday night Handicap Blitz, where one game ended with a player picking up an opponents piece and checkmating himself with it! The 2013 Dubbo Open is a tournament full of surprises. The first big surprise was the field of 46 players. With only 30 players entering before the morning of the tournament, the organisers were expecting a 'down year' after a run of good numbers. However a good number of 'walk ins' brought the field up to 46 which left the Dubbo Chess Club Treasurer with a big smile on his face. Once the play began there were a couple more surprises. While a normal tournament has its fair share of underrated juniors, Dubbo seemed to have a group of pretty good, unrated adults as well. As with other country events, there were a number of players who were either making a comeback after a significant number of years away, or simply not had the opportunity to play face to face tournament chess. As a result there were a more than a few upsets in each round. At the end of Day 1, one of the unrated players, Dragan Granjas, shares the lead with 3/3. Two of his wins were over Fritz Van Der Wal and David Locejoy, who had both preciously won the NSW Country Championships. Joining Granjas on 3 points were Jeffrey Plew, Don Keast and Harry Press. Closely behind them on 2.5 were Bruce Muray, Trent Parker, and tournament organiser Alexander Aich. Aich had a good start to the tournament ("My best first day ever" was his comment), drawinf with Leon Kempen in round 2 and beating Fritz Van Der Wal in the third round. Tomorrow will see Plew v Press and Granjas v Keast on the top boards, with the winners then meeting in round 5. The 2013 Candidates Match begins shortly. The games are scheduled to start at 2pm London time, which is 1am Canberra time. I've revisited the tournament website, and it looks like they've added a number of extra features since I last had a look. Still tipping Carlsen over Aronian, and I note a number of other pundits are also tipping Radjabov as the possible surprise packet of the tournament. Meanwhile I am off to Dubbo early in the morning for their annual Open. It looks reasonably strong at the top (although about 900 rating points below the Candidates), so a good contest is likely. As DOP I'll try an blog some of the more interesting happenings at the tournament, while keeping one eye on the goings on in London. At the risk of repeating myself every six months or so, the Canberra Lifeline Bookfair is on tomorrow. Once more I will join the end of a very long queue and go hunting for increasingly rare second hand chess books. The only change for this years event is they have taken the sensible decision to open an hour early, and close an hour late. Hopefully the earlier start will catch out some of my fellow collectors! **Postscript: Arrived a little late myself, and missed the big queue at the door. Good news is that their seems to be plenty of chess books on sale, so if you get there over the weekend you should be able to pick some additions to your library. IM Andrew Brown has extended his lead in the 2013 ANU Masters to a full point after fifth round results fell his way. A miscalculation towards the end of his game against Kishore Sreetharan left him down a piece, but this actually contributed to his win as the unbalanced position quickly turned in his favour with both players in time trouble. FM Junta Ikeda escaped with a draw against Steven Sengstock after the later built up a very strong position. However running short of time Sengstock decided that a safe half point was good enough, allowing a perpetual check. Adrian De Noskowski was also able to slow one of the leaders, taking half a point from Michael Wei. At one stage Wei was a pawn up, but De Noskowski was able to hold the position. Jeremy Reading scored his second consecutive win, after beating Justin Chow. Chow sacrificed an exchange out of the opening, but a miscalculation allowed Reading to consolidate his material advantage, winning soon after. Yijun Zhnag tried to hold a blocked position against Andrey Bliznyuk, but seized control of the only open file and then slowly manoeuvred his pieces to their best squares before engineering the decisive breakthrough. At the halfway point Brown lead with 5/5, followed by Ikeda on 4/5 and Wei on 3.5. Bliznyuk is on 3 but has one game in hand. Despite the prohibition on disturbing your opponent during a game, some people can't help but talk while playing. Of course it is rare in serious games, but in allegro's (G/15m) and Blitz it is much more common. In fact a previous organiser of Street Chess even had a rule which went "non-aspersal mutually agreeable banter is allowed". Of course it is all fun and games until someone drops a piece. Even then I've seen it happen in serious (club) games, although the worst offenders are also the most likely to complain when their concentration is disturbed. But there is an attempt to bring the art of conversation to serious chess. GM Nigel Short and GM Ehsan Ghaem Maghami have just a match in Tehran where the players talk about the game while it is in progress. Every 5 or so moves the players would go to a recording booth at the side of the stage and talk about their position. As the players aren't talking to each other (only the spectators can hear the comments), part of the fun is comparing the two players opinions. The match consisted of a mixture of classical, rapid and blitz games, with Short winning both the Classical and Rapid matches 3-1 while I believe the blitz finished 4.5-3.5 in Short's favour. The event website is here and the final game seems to have just been completed. However if you go to the 'Schedule Table' you can look at the completed games, and even replay the comments from the players. To pass the time when travelling, my son and I often pass the time playing blindfold chess. It doesn't always work, as we do lose track of the position, or simply run out of time. However the following game was played today, while waiting for the bus to take us to the Canberra Centenary celebrations. (and yes, I was black). As had been remarked by numerous people, Midsommer (from the television series Midsommer Murders), might be the most violent place on earth. Not a week goes by without 3 or 4 bodies turning up in the woods, stately homes or church altars, with the victims usually having some previously unknown link. Of course with such a high murder rate, you would think there wouldn't be anyone left, but you would think wrong. Having disposed of artists, church bell ringers, and miniature wargamers in previous episodes, the writers of Midsommer Murders have know taken to killing chess players. In the episode titled "The Sicilian Defence" the President of the local chess club got bumped off, soon to be followed by the club arbiter. Interestingly this happened in the middle of the Club championships, which for some reason continued as if these events were of little importance. As a fan of the series I actually thought the episode was a little weak (too many unhinged suspects seemed a bit of lazy writing), but the chess aspects were generally OK. They got most of the terminology correct (eg no fake "The Kizapatserov Gambit" openings) although the history of chess was changed (for plot related reasons). The tournament must have been quite popular as the boards seem quite cramped, and my wife was surprised at the number of female players taking part. I won't give away the identity of the murderer, but I will reveal the identity of the game that was left as a clue by the killer. Sensibly the writers avoided a really well known game (think the chess scene in Blade Runner), but still chose a high quality one. 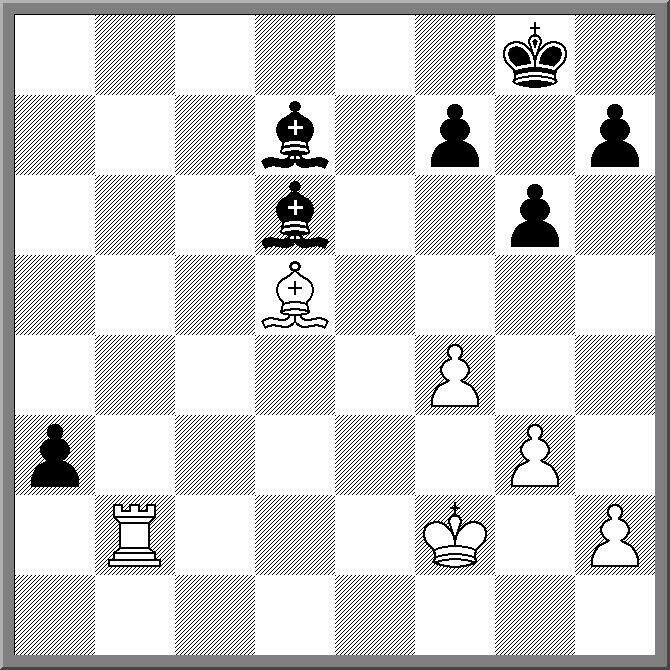 The game in question was Unzicker v Fischer from the 1962 Chess Olympiad, which Fischer won as Black. Fischer (whose birthday was yesterday btw) no doubt liked the game himself, as it appears as game no. 42 in "My 60 Memorable Games"
Ran a very successful Street Chess today, with 2 FM's and a WIM part of the 26 player field. FM Junta Ikeda took home first prize with 7/7, while FM Endre Ambrus was runner up with 6/7. Then followed this up by watching the ACT Brumbies flog the NSW Waratahs 35-6. All in all an excellent Saturday! If I am trying to hack my opponent, then a move like Nce4 is usually a signpost on the road to success. It normally happens when the kings knight is already on g5, although it sometimes occurs in the reverse order (Ne4 followed by Nfg5). Courtesy of Chess Today comes an example of such an attack, with both knights charging the kingside, before the queen and bishops finishing the job. I came across the following game in one of my old chess books. Apparently it was played in 1924 between Saemisch and Herzog. I assume it was Fritz Saemisch who was white, given the quality of the attack. Oddly, it doesn't show up in my database, although it has been christened "Saemisch's Immortal" on at least one chess forum. I'm wondering under what circumstances the game was played as my initial source ("The Fireside Book of Chess" first published in 1949) called it an "unknown masterpiece" and claimed it was the first time the game had appeared in book form. Another win for IM Andrew Brown has kept him in front in the 2013 ANU Masters. Yijun Zhang misplayed the opening as early as move 6 and Brown was able to establish a decisive advantage soon after. FM Junta Ikeda kept pace with Brown after a tough win over Michael Wei. For a long time the position looked balanced, but Ikeda was able to break opne Wei's kingside after Wei missed defending an important square. Andrey Bliznyuk took advantage of some loose piece placement by Justin Chow and was able to win material in the middlegame. Stephen Sengstock beat Kishore Sreetharan which was heavy on Nimzo theory, but towards the end was about converting a material advantage. Adrian de Noskowski's run of bad luck continued after losing against Jeremy Reading. He had an overwhelming advantage during the middlegame, and was even able to give up his queen without endangering his winning chances. However he began to lose the thread of the position and Reading was able to generate enough counterplay to eventually turn the tables. After 4 rounds Brown leads the tournament with 4/4. Ikeda is close behind on 3.5, with Steven Sengstock on 2.5. Both Andrey Bliznyuk and Michael Wei are on 2, but each has an extra game to play. A few non-active chessplayers I know (one can never truly be an ex-chessplayer) were surprised when I mentioned the Candidates tournament was starting soon. At least one was under the impression that such events had been confined to the pages of history, which is understandable given the chopping and changing of formats over the last 20 years. However the event is really taking place, and starts on the 14th of March (first round is on the 15th). It is almost a return to the traditional Candidates format, although it is only a double round robin, rather than the quadruple round robin in the 50's and 60's. I'm also assuming that there won't be any 50's style 'teamwork' either, given the make-up of the field. Magnus Carlsen is the rating favourite to win, and certainly my tip. Of course I will also be cheering on Lev Aronian, while Vladimir Kramnik is also a potential winner. Teimour Radjabov looks like the dark horse in the field, but I cannot see the other four players (Gelfand, Ivanchuk, Svidler and Grischuk) scoring an unlikely victory. The tournament website seems a little sparse at the moment, but surely this will change closer to the start of the event. Next Tuesday (12 March) marks the 100th anniversary of the founding of Canberra. While the big activities are on Monday the 11th of March (having a long weekend is slightly more important than having a holiday on the actual day), there is plenty to do over the whole weekend. Having lived in Canberra since 1980 I think the fact the city is turning 100 is a pretty big deal. So to help celebrate the occasion, Street Chess is offering a larger than usual prize pool this coming Saturday. Nothing too spectacular, but the tournament will be offering a $100 first prize, with other prizes increased/added. (Note the suggestion of 100x the usual prizes was just a little extravagant for the tournaments finances). So if you want to celebrate Canberra's 100th Birthday, and the rich chess tradition that the city has, come along to Street Chess this Saturday (9th March) at 10:45am in City Walk, Canberra City. During the 2012 Olympiad I managed to play a couple of games. GM Dejan Bojkov was the team captain for the PNG team and helped me do some preparation for both of the games. In one of the games we suspected my opponent would defend 1.e4 with the Ruy Lopez, and quite possibly try the Steinitz Variation. (As it turned out he played the Ruy, but varied with 3. ... a3. The game was eventually drawn). As part of the preparation Djean showed me the following game, which he said was known as the Dresden Trap (after the city it was first played in). It is a particularly clever trap, in that White should only win a pawn, but if Black tries to hang onto it, he will then lose a piece! I'm assuming the whole line was also a nice piece of opening preparation by Tarrasch, as according to Fred Reinfeld, Tarrasch only used 4 minutes for the entire game. Having just discussed the number of draws in the Zurich Chess Classic (although in all cases they were pretty exciting ones), GM Ian Rogers weighs in on the topic of *short* draws. He specifically discusses the final round of the Reykjavik Open, when the game on board 1 went 1.d4 Nf6 2.c4 g6 3.Nc3 d5 1/2-1/2. As is Ian's style he doesn't hold back, even giving fellow Chess Life blogger Greg Shahade some criticism. As someone who as directed tournament which have had restrictions on when draw offers can be made, a legislative solution can sometimes be difficult (ie determined players can always find a way around the rules, and conclusively proving collusion is often difficult). I do like the approach that the Doeberl Cup currently uses (offering a potential reward for players who do not agree to short draws), but in the past I have also suggested another approach. Instead of defining the number of moves that must be played, instead specify the minimum number of minutes. That way spectators get a guaranteed viewing time, although there is no control over the quality of the game (Banning the Exchange Slav is probably a step too far). My original proposal can be found here.